Home Uncategorized What’s next for Whitney Otawka, formerly of Cinco y Diez? 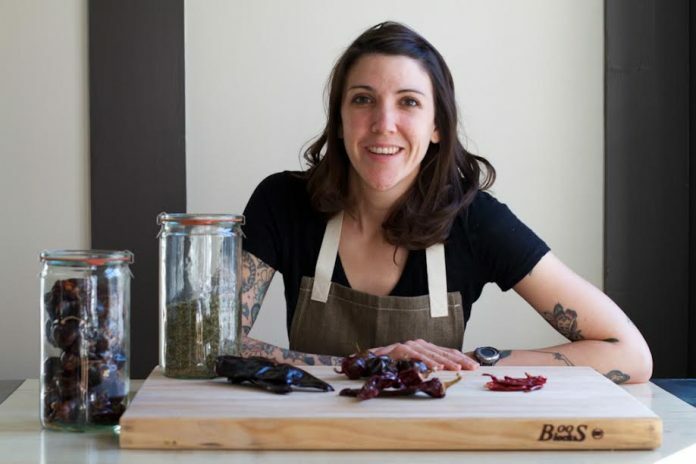 What’s next for Whitney Otawka, formerly of Cinco y Diez? Could a new restaurant be in the works? Last Sunday, Hugh Acheson’s Mexican restaurant Cinco y Diez opened its doors for the last time. Less than one year in, the restaurant, led by executive chef Whitney Otawka, closed because “the business side was lacking,” according to Acheson. Now Otawka—who previously served as executive chef of the now defunct Farm 255—is working on her next steps. We’re so sorry to hear about Cinco y Diez. What are you up to these days? I found out basically the same day the staff did—on Sunday. We’ve been working on the SFA Symposium in Oxford, Miss., this week. It’s a really big deal for us to participate. I don’t know if you heard, the Symposium sold out in three minutes. Tell us about the Symposium. Saturday we’re doing a dinner with Duane Nutter, Kevin Gillespie and Eddie Hernandez from Taqueria Del Sol. We’re making feijoada—the national dish of Brazil. We have lengua, oxtail, and Portuguese sausage, braised in black beans, and served with collard greens, white rice, and oranges. Hugh actually offered us the kitchen at Five & Ten, but we opted to prep out of our home. What happens when that’s over? I’ve always cooked with my now fiancé, Ben Wheatley, [formerly chef de cuisine at Cinco y Diez.] We met while working with Hugh at Five & Ten. We created something quiet unique and beautiful. My main focus is making sure our staff is taken care of. It was the best staff I’ve ever trained or worked with. We’re planning a big dinner on Day of the Dead for the staff. We were supposed to have a big party at the restaurant [for customers] that day, but now it’ll be for the staff. Are you already considering different opportunities? We used to work on Cumberland Island, and we’re still great friends with the family who owns it. Ben might take them up on an opportunity there. And you? Are you thinking about opening your own place? Eventually, I want to be a proprietor of my own establishment, but I might take my time and do some traveling. I live to travel. A year ago, I spent time in Oaxaca and Mexico City. It was so inspirational and beautiful. I got really into the cuisine. Sometimes you get so busy you get stuck in your bubble and forget to look around. Then things happen and it gives you the opportunity to travel and read books and get inspired. We have a sous chef Alejandro Tamez who we’ve always worked with. He’s getting interesting opportunities here in town, but not of the caliber he’s used to. The ultimate goal is for all of us to reunite. For the Cinco fans, the heart and soul of the restaurant is still very much alive. It’s just not the same space or the same town. Would you open a restaurant similar in style to Cinco? I could definitely say there could be a possibility of a similar concept using the ideas and the technique of Mexican cooking. The recipes were ours. The cuisine was developed by us. Every day was a new exploration of what we were going to cook that day. If I had the right investors or the money, of course I would just open for myself. I feel very accomplished in the things I’ve achieved. But I don’t have that luxury. I could probably get a small loan. … That is sort of the plan. Where would your restaurant be? I love Athens but I’m not sure I’d pursue a business opportunity in a smaller town like this. I like to have a larger audience. It’s a matter of finding the right place for us. There is a place to grow this type of cuisine in the South. In California, where I’m from, it’s a cuisine people were very familiar with. Would you come to Atlanta? Atlanta has crossed my mind in the past. But I think about people like Hugh—he didn’t stay in one place. He expanded from Athens to Atlanta to Savannah. There’s something to constantly thinking about where you can go.